I would love to bin my razor and never have to wax anywhere ever again if I could, but until that day, I’ve opted to start my IPL journey with my bikini line. I headed to the salon, not knowing what to expect, as the only patch tests I’ve had, have been for tinting. I was met by Charlotte, one of the managers at the salon who took me to one of the treatment rooms. Charlotte asked what I knew about IPL, which was only what I had read online. 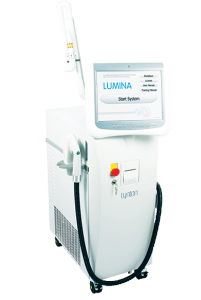 Charlotte explained that they use a medical grade Intense Pulsed Light (IPL) Laser, the Lynton Lumina, and that the pulsed light is better for the skin. I was then asked a series of questions to determine my suitability for the treatment, both from the salon’s point of view, and my own. This included questions about sun exposure and medication. You are not to have laser treatment if you have been exposed to the sun within the last 4 weeks, and you are also not to use fake tan in the area. I was then asked to sign that the information I had provided was correct, so that we could start my patch test. I was advised that most people see an 80-85% reduction in hair growth within the area, but this does vary depending on skin and hair. It it probably worth noting that I have very pale skin and dark brown hair, which is meant to see the best results from IPL. I was then given glasses to protect my eyes from the light and Charlotte applied ultrasound gel to the area. Two different strengths were used in order to see how my skin would react to the treatment, and obviously to determine my pain threshold. In terms of what the IPL felt like, it was like being twanged with an elastic band, which is how it is often described online. I can’t compare it to a tattoo as many reviews have, as I don’t have any. There was no immediate reaction from my skin, so I booked in to have my first session at the weekend. I expected to see some reddening or sensitivity over the next few days, but nothing appeared. To prepare for the treatment, you have to shave the area, which is recommended that you do a couple of days before in case you have any sensitivity from a shaving rash. Your skin is to be clean and lotion free. I was met by the lovely Nicci who would be doing my treatment. Nicci went back over the consent form, to ensure nothing had changed, prior to starting the treatment. I was given some very fetching paper knickers, the same ones you get for spray tans and Brazilians. Nicci applied the ultrasound gel and started. To begin with, Nicci started on a low setting, which was only a little uncomfortable, so we upped the setting. This was a little more painful, but by no means unbearable. Within two minutes, the first side was complete. Nicci advised that the burning smell was a good sign, but to be honest, I couldn’t smell anything. In total, my whole treatment took five minutes. I couldn’t believe it. Having spent a good half hour in the past being waxed within an inch of my life, I couldn’t believe it was over so quickly. The area treated was ever so slightly pink; it looked as though I had a mild shaving rash, which disappeared within an hour or so. After the treatment, you are advised not to have a hot bath or shower, as the area can be sensitive, and I did as I was told. I expected to feel sore and uncomfortable, but I felt nothing. I’ve actually felt more after a waxing session. You are also advised that you will need a course of between 6-12 sessions, which varies depending on skin and hair type. I booked in for a 6 session course, at a cost of £240. This may sound like a lot of money, but if I were to have 6 waxes at £30 a go, the IPL works out as only £50 more. I can’t see any change yet, but it is only two days after my first treatment. I will keep you all updated along my journey, my next session is booked for 5 weeks time, so there will be a little wait between posts! Have any of you had IPL? Did it work for you?